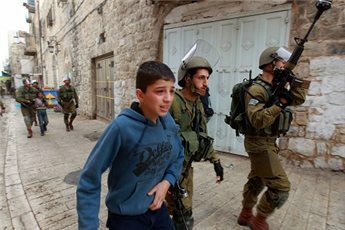 BETHLEHEM (Ma’an News Agency) — Some 700 Palestinian children per year are arrested and face “ill-treatment” by Israeli forces, according to a new report by a children’s rights group. According to research conducted by Defense for Children International — Palestine cited by the report, some 56 percent of children report having experienced “coercive” interrogation techniques during their time in Israeli custody. “This detention is a clear violation of children’s rights under several international human rights treaties to which Israel is a party,” the CRIN report said. The report highlighted a case in which a 14-year-old girl from Ramallah was arrested on Dec. 31 and held for 22 days in Israel before being issued a sentence. The report recommended reforms while noting that countless other recommendations by human rights groups regarding the treatment of Palestinian children in Israeli custody have gone unheeded by Israeli authorities. Ultimately, CRIN concluded, children will never be treated well under an Israeli military justice system.